Brian Glasser, author of the book In A Silent Way, A Portrait of Joe Zawinul, sent this review of the Zawinul Syndicate at London’s Jazz Café on March 19. It is in two parts. 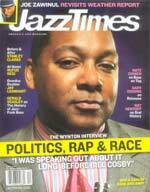 The first is a conventional review that will appear in a UK jazz magazine. It is followed by a postscript Brian wrote for Zawinul Online readers. It’s been three years since we last had Zawinul—who is both almost 75 and totally ageless—in our midst, although there’s been a fair amount of disc activity to tide old fans over and win some new ones: a Syndicate double album recorded at his nightclub in Vienna; the Weather Report Best Of, with its priceless DVD of the Pastorius-Erskine group; and Brown Street, the Vince Mendoza-arranged big-band album of Zawinul compositions, which has garnered universal A-star ratings. But real live Zawinul has always been something special, and no news is good news on that front—he’s the same as ever, and showing no signs of mellowing, slowing down or otherwise compromising. That’s an admirable achievement in itself, when so many others seem to be forced to conform in one way or another. Meanwhile the Syndicate has had a refresh, with an extra (hand-)percussionist in the shape of Brazilian Jorge Bezerra; his countryman Alegre Corréa on guitar; and Moroccan Aziz Sahmaoui on vocals and percussion. Add the Mauritian bassist Linley Marthe and the Belgian/DR Congolese vocalist Sabine Kabongo and you’ve got a wonderful embodiment of Zawinul’s deep-seated one-world ethos. These are all good players of course, but the biggest applause for a new recruit was reserved for a recidivist—Ivorian drum marvel Paco Sery. Undoubtedly the group has an extra magic when he’s in it, and it was fascinating to watch how he and Zawinul manned the engine room for the band throughout. (Zawinul’s professionalism in this respect is surely borne of his long early years spent in service as a sideman to the greats.) That said, Zawinul’s lead playing was also a masterclass in rhythmic subtlety and tonal colouring. As usual, the repertoire consisted of some Syndicate tunes, some Weather Report stuff and a few party pieces for the band members. The best of the latter was the gorgeous duet between Zawinul and an mbira-playing Sery. The best of the former were a killing version of “Madagascar” (originally on Weather Report’s Night Passage album), its wide-ranging dynamics and smouldering sexiness reinvented brilliantly; and “Rooftops of Vienna,” the bring-the-house-down, hundred-mile-an-hour closer. If people could read in between the lines of the above, they might see this: Zawinul’s gigs are, in my opinion, always very good. That’s partly because there’s—still!—no one who comes close to doing what he does musically; and partly because he is a consummate professional who understands the obligation to work for his pay. But some shows—the vast majority that I’ve been to—go way beyond “very good.” I assume that all of this site’s visitors have seen him a few times over the years, so I don’t need to go into details. So I was reminded—as I mention in my ‘official’ review—by the mastery of Zawinul’s tonal selection and manipulation on his keyboards. He has some new sounds each tour, and he unfailingly deploys the right ones at the right time. Besides that, he bends and distorts notes at the same time as he’s playing important, obviously improvised lines. The man’s brain must have some elaborate, high-capacity wiring; and remarkably, at the age of nearly 75 and 60-odd years into his career, it’s showing no signs of degeneration or even lazy habits. Also—and again I touch on this above—his prowess as an accompanist is amazing. Linley Marthe is a fabulous bass player who makes a huge contribution to the group, but Zawinul and Paco Sery, in tandem, are the people with their hands and feet on the band’s controls. Zawinul’s comping—now there’s a small word that encompasses a thousand skills—and bass lines are laser-like in their accuracy and power, generating a strong-flowing river of sound to transport the tunes. Zawinul likened Sery to Paul Gonsalves in the Ellington orchestra—someone who would leave from time to time but always come back to the fold. The drummer seems to have caused some administrative headaches in his time, but surely neither he nor Zawinul can doubt the enormous mutual benefit of his presence in the Syndicate. So: the best Syndicate gig I’ve seen? No. But a fantastic evening’s music? Oh yes. The Zawinul Syndicate is in the midst of its month-long Spring tour, and we have some reports from Zawinul Online readers. I just got back from seeing the band at the Jazz Café London on their third night. I saw the Syndicate there two nights in a row in the summer of 1991. Back then they went on into the early hours, after which I spent ages traveling across London on the night bus. Nowadays they finish at 11 p.m. while the tube is still running. You need to book a table and food in order to sit. My friend and I found the food was good and the view was good, although the PA obscured Aziz. Most important, the band was cooking from the start. Joe’s bands are like a cauldron of eternal gumbo to which fresh ingredients are added every night. I respect any musician who gets to play with Joe, but the return of Paco Sery always brings a special spice to the mix. Linley Marthe was equally stunning. I’m not qualified to say if he’s playing even better than three years ago when the Syndicate last visited, but he demonstrated phenomenal chops on his solo, where he really let loose. The level of interaction between the entire band was sensational. Aziz Sahmaoui, Alegre Corréa and Jorge Bezerra each brought their own vigour to the music, so that I never missed their illustrious predecessors. Sabine Kabongo has made her own place in the music. Her solo feature on “Can It Be Done” was a great tribute to Joe’s eternal quest for new sounds and killer grooves. As has been said before, catch this band if you can. Travel far if necessary, for inspiration is guaranteed. After the break, the band was even more powerful. Evolving with “Café Andalusia,” “Fast City,” a modest “Can It Be Done” (sung soulfully by Sabine, backed by the most beautiful keyboard sounds of an appreciative Zawinul), “Badia/Boogie Woogie,” “Tower of Silence” and the finale: “Rooftops of Vienna.” Party! Marked something unusual during this show? Maybe. At the end Zawinul introduced the band members but forgot to mention Aziz. It was very sweet to see the way Jorge tried to attend Joe–again back behind his keyboards–about this small non conformity. But no niggling! A great show. A great band. A fantastic audience. Dear Joe, Aziz, Paco, Jorge, Lynley (making fun and comfort of his great skills, and probably never gets tired? ), Sabine and Alegre: THANK YOU THANK YOU THANK YOU THANK YOU THANK YOU THANK YOU THANK YOU. I’d like to pass on some thanks to Joe and his crew. I went to the first performance at the Jazz Café in London on Monday last. I had the most brilliant time, sat right in front of Joe’s keyboard stack! 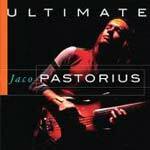 Also due from Mosaic Contemporary is Ultimate Jaco Pastorius, a compilation scheduled for release on April 2. The CD includes 10 tracks culled from Jaco’s solo work, as well as with Weather Report and Joni Mitchell. As one who came up with jazz in the seventies, I wish them well. The news seems to get better and better for Weather Report fans, as there’s been a recent revival in bringing the band’s material to market. Last Fall saw the release of Forecast Tomorrow, which includes an entire 1978 Weather Report concert on DVD. And of course there’s Zawinul’s recent album, Brown Street, which casts a number of Weather Report tunes in new guise with the WDR Big Band. Now comes the DVD Weather Report: Live at Montreux 1976, due April 17 from Eagle Rock Entertainment. The Montreux Jazz Festival folks have recorded and videotaped their concerts for years, and their sister company, Montreux Sounds, in conjunction with Eagle Rock, has been bringing out an entire line of “Live at Montreux” DVDs. 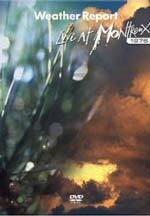 This DVD captures Weather Report in the summer of 1976 during Jaco Pastorius’ first year. He had recorded on the album Black Market earlier in the year, and made his first appearance with the band on April 1. The line-up included Alex Acuña on drums and Manolo Badrena on percussion, along with Joe and Wayne. Bootlegs of this concert have floated around the trading circuit for years. (In fact, you can probably find clips on YouTube right now.) But this is the first time this concert has been released officially, and we can expect the quality to be first-rate. And at $14.98, the price is right as well. I haven’t been able to verify the regions for which the DVD will be available; hopefully it will be US, Europe and Japan. This is Weather Report at the cusp of greatness. A must for Weather Report fans. Another Montreux production of note is Carlos Santana and Wayne Shorter: Live at the Montreux Jazz Festival, recorded at Montreux on July 14, 1988. 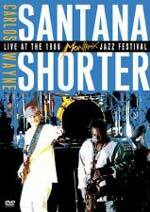 This DVD is over two hours long and contains interviews with Santana and Shorter, as well as Montreux Jazz Festival founder Claude Nobs. The band included former Weather Report bassplayer Alphonso Johnson, as well as drummer Leon “Ndugu” Chancler, who performed on Weather Report’s Tale Spinnin’. Among the tunes is Zawinul’s “Black Market” from the Weather Report album of the same name. Released in Japan in 2005, the new release from Image Entertainment came out on February 27 for the US market. Finally, Stanley Clarke is the subject of the Before & After column. First up is “Port of Entry” from Weather Report’s Night Passage, followed by “Good Question” from Mike Stern’s album Who Let the Cats Out, featuring former Syndicate bassplayer Richard Bona. After successfully introducing the German Jazz elite last year, jazzahead! presents some of the most interesting European artists from Thursday, March 8th until Sunday, March 11th, 2007. Musicians from six countries will come together in the Congress Centre Bremen with backing from “Culture 2000”, the support programme of the European Commission, and a profile of the new Jazz scene in Europe will be heard. Along with new tones, there will also be world-famous stars to experience: Joe Zawinul will be distinguished on March 8th with the jazzahead!-Škoda-Award. I’ve updated the Tour Dates page with the latest touring information I have received. I also understand the Paul Shigihara, guitarist for the WDR Big Band, will substitute for Alegre Corréa on March 8.